When the World Resources Institute (WRI) wanted to draw attention to nutrient pollution of coastal waters, they turned to Blue Raster to develop an interactive website and GIS application to depict and track this growing problem. The central feature of the WRI’s Eutrophication and Hypoxia: Nutrient Pollution in Coastal Waters website is an interactive map, which combines geographic, environmental, and time-lapse data. Blue Raster developed the user-friendly application using ArcGIS Server and Flex API to create a comprehensive look at historical and recent eutrophic and hypoxic events around the world. The interactive map allows users to investigate 762 coastal areas around the globe that have been affected by eutrophication and hypoxia. The data, which was compiled by analysts at WRI and the Virginia Institute of Marine Science, includes 479 sites identified as experiencing hypoxia, 55 sites that once experienced hypoxia but are now improving, and 228 sites that experience other symptoms of eutrophication, including algal blooms, species loss, and impacts to coral reef assemblages. Using Flickr, YouTube and Delicious, Blue Raster provided users with the ability to access and share other resources on eutrophication and hypoxia, including publications, photographs, and video. 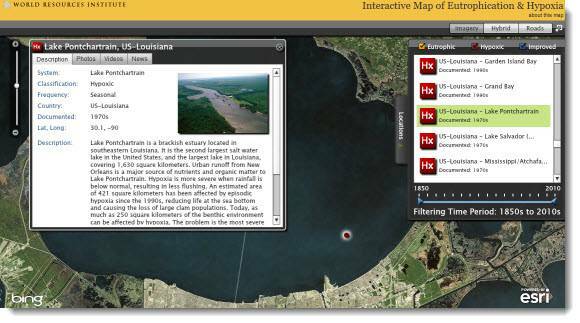 The site also allows users to provide updates to the maps and databases based on their knowledge of local coastal water conditions. To learn more, please visit WRI’s website on nutrient pollution in coastal waters.